If sociologist Janet Poppendieck had it her way, school meals would change. Forget the often-unappetizing burgers, pizza and fries loaded with sugar, fat and salt; instead, Poppendieck sees school lunches and breakfasts offering healthy, fresh foods—all for free. 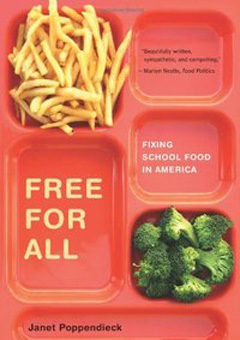 Free for All investigates the federally funded school breakfast and lunch programs, tracing the programs’ evolution from a simple solution for food surpluses during the Great Depression to the defrost-and-reheat items of today’s cafeterias, where more and more meals are skipped and wasted. Through extensive research and interviews with government and school officials, lunch workers, students and activists, Poppendieck reveals how schools are struggling to meet federal nutrition guidelines and student tastes with small budgets. But the book isn’t all about the bad. Poppendieck also writes about the successes—where universal programs and healthy, fresh foods have been embraced, including Philadelphia’s own universal feeding program. And, she outlines her solution for fixing school meals, crunching numbers in defense of her argument that the cost of free, truly nutritious school meals is well worth a generation of healthy children. To learn more about Janet Poppendieck, visit janetpoppendieck.com.